Use the index below to quickly access an area of interest. 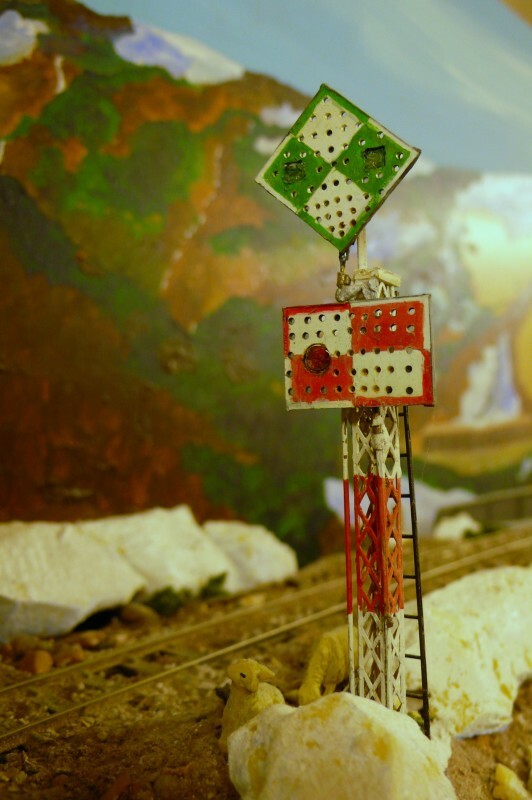 During the 1950s and 1960s Model Railway Constructor ran a series of articles called 'Signalling Safari’ investigating various aspects of British signalling practice. This article attempts to do likewise for the AFK. As I have noted elsewhere, many modellers seem to have little or no knowledge of railway signalling systems and would appear to have little desire to rectify their lacuna. I suppose that the matters covered within this article may be considered rather esoteric by the majority of visitors to the website. Hopefully a few will be interested. Signalling on narrow gauge railway systems, as opposed to standard gauge installations, is an awkward subject to discuss. Some NG lines managed to run without any signals whatsoever, many possessed the bare minimum necessary to do the job and a few were lavishly equipped. The layout is definitely at the latter end of the spectrum but can putatively justify this level of provision given that it is a railway of regional significance. Where the AFK deviates too far from reality to be credible is in the variety of equipment provided. In real life railway companies standardised their provision to allow for easy maintenance and replacement if necessary. Replication of the mundane helps foster the illusion of reality and those seeking to create such would be well advised to heed the gurus who suggest that the 'plain vanilla' option should suffice. The AFK has eschewed this choice (raspberry ripple with chocolate sauce covered in hundreds of thousands?!) and has deliberately selected as wide an assortment of examples as possible thereby, I suppose, shattering any credibility in the process. A typical wayside station is illustrated above. These instructions are to be read in conjunction with the Operation of Block Instruments section. 1. Signal operation. Signals must be cleared promptly when it is safe to do so. (i) Enirasignaloj (ES) A and C indicate that a train can to proceed into the station when they are cleared. (ii) Forirasignaloj (FS) B and D indicate that a train may leave the station when they are cleared. (iii) Antaŭsignaloj (AS) Bx and Dx indicate that the route is set for the RT AND that the relevant departure signal is clear when they are cleared. If signals Bx and Dx are not clear this indicates that the train will either enter the loop (PFT) or that it will enter the main running line (RT) but that it can expect to stop. 2. The normal procedure is for a train to run through the station on the mainline (RT) unless there is a reason to divert it into the loop (PFT). 3. Trains being diverted into the loop are to reduce their speed to 15 kph on passing the entry points, unless otherwise authorised. 4. Points 1 and 2 are operated from the station signal frame (as shown by the back triangle). They are worked by the 180° throw point levers and interlocked with the signals. 5. Points 103 and 104 are released by keys interlocked with the signal frame (as shown by the grey triangle). These points give access to sidings connecting with the running lines. 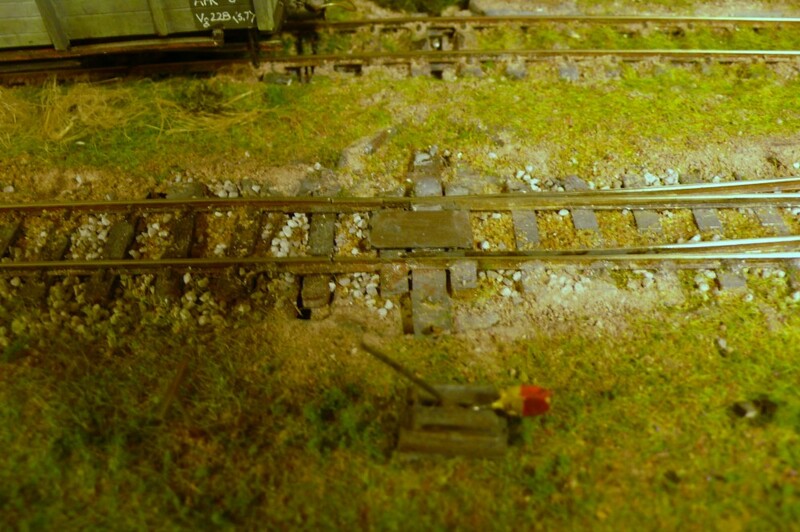 These sidings must not be used for running moves unless specifically authorised. When the point lever is reversed the operator must check that the co-acting derailer has moved clear of the siding that it protects. The keys are locked into the operating mechanisms of the points when reversed and cannot be released unless the relevant points are in the normal position. These keys must be returned into their slots in the locking frame to allow signals A and C to be released. To avoid delay to through trains this must be done, as far as possible, 5 minutes before the signals need to be cleared. 6. Points 105 (as shown by the white triangle) are free of any interlocking, as is the wagon turntable. Drivers should ascertain the position of these items of equipment before proceeding over them. 7. As far as possible vehicles should not be left standing on the mainline between the ES and the entry points. This can only be done where authorised. Shunt movements should not proceed beyond the shunt limit board (LM) behind the ES and should not activate the Block ramp. 9. As far as possible passenger trains should use the rektatrako. This will prevent the need for passengers to cross the running lines. If two passenger trains are to cross with each other the train arriving first must arrive on the RT next to the station building so that there is no need for passengers to cross a running line to reach the train which will depart first. 1. This picture has been used elsewhere but it illustrates a completed block instrument, albeit that there are errors that need rectifying. The first point to note is that the frame and instruments are in full view of the general public and stand on the platform (at Relforka Lacono in this case), rather than being sequestered in a private box away from prying eyes. This was often the case on the European NG and at minor stations on the SG. This equipment was not worked by a dedicated signalman but by a member of the station staff, under the supervision of the stationmaster, and was placed close to the station building, often on the platform, for convenience's sake. The frame is laid out in a typical German style. At the left there is the points frame with one lever in the reversed position. The points were operated by the double wire system which effectively functioned like an economic pointlock on the British systems, which was a characteristic of Midland Railway equipment. There were three stages in operation. The first third of the pull unlocked the point, the second third moved the blades and the last third detected and relocked them. The levers have been painted according to German practice with blue indicating points and the blue and red being used for derailers which performed the same function as trap points in British practice. There are more than would normally be present as the SG crosses the NG between the station and the adjacent goods yard. This crossing is protected by the frame. In the centre there are the signal cranks. These were rotated clockwise or anticlockwise depending upon whether a clear signal was exhibited (clockwise) or a reduced speed indication was needed (anticlockwise). By continuing to turn the crank with the home signal showing the required aspect the distant signal's drive was engaged and it could then be wound round to display the correct aspect. The position of the arms was indicated by an arrow which moved to point at the selected aspect which was shown on an enamel display. The arrows are there but the enamel parts are not at the moment. The model is also wrong as the yellow distant cranks were never found on the prototype but I had not appreciated this when the model was built. They will, at some point in the future be painted white which, as in British practice, indicated a spare lever. The block instrument stands to the right of the signal frame. These were substantial machines intended to be bolted to the floor rather than the usual British instrument which was designed to go onto a shelf. The instrument was mechanically interlocked with the signals by a series of bars and hook locks (hence the requirement for robustness) which lay in a tray behind the instrument and frame. This machine is an Eingleisestrecke bautyp C which became the preferred installation on German single line systems. There are three flags which rotate to show red or white depending upon the state of the line. The levers above the windows were depressed and a hand crank was wound round to generate current for whatever action was needed. At the far right stands the block bell, which was usually a two tone instrument, as here. A single beat resulted in two rings with the second bell often pitched at a fifth below the first bell. The bell was not used in the same manner as the British bells but it did convey messages. On the AFK two two-tone rings (ding dong pause ding dong) indicate that an up train has entered the section and three rings indicate a down train. There were often intermediate bells connected into the circuit so that lineside staff were aware that a train was coming which could be an advantage when an emergency code was rung out. This bell follows Bavarian practice in that there is an indicator, the disc, which would rotate to horizontal when the bell rung and had to be replaced by the recipient to the vertical axis. This was sometimes done with wires where the bell stood outside at a location at which a signal box had been provided! 2. This is a picture of the incomplete (and warped) frame at Boursson which needs some attention before it is fully finished. This is typical of the AFK intermediate station's provision. The two block instruments stand at the left and the point levers for the entry and exit points are alongside. To the right of these are the keys which were used to release the siding points in the main running lines (the Schlußelwerk system). These were turned through 90° to release them which operated a rod which locked the signals at danger. Obviously if the signals were clear the points could not be unlocked. The four entry/exit signals are worked from the cranks. The prototype frames usually omitted the exit signals. Perhaps the most obvious omission from the model as it stands is the locking tray. 3. Again this is a picture that has been used elsewhere but it shows a member of the train crew involved in shunting at Boursson. The point in the mainline, in the foreground, was released by the key before it was reversed. The signals are now locked at danger. 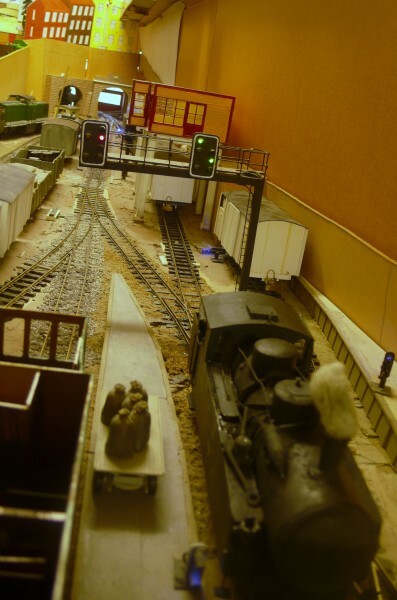 The signalling equipment also included the hardware necessary to operate the points as well as the actual signals. 4. German practice was to cover the moving parts of the point blade rather than leave them exposed to the elements, which eases the modelling problems encountered in this area when compared with their typical British equivalents. This is a hand thrown point in the main running line giving access to a siding. It would be unlocked with one of the keys shown in photo 2 to allow the lever to be thrown. The design of point levers varied as did painting and numbering conventions. Here at Boursson the levers are based upon French designs but follow the Swedish practice of painting levers red and yellow. At Breĉo de Glissent the more common black and white scheme has been used. 5. This point is worked from the frame at Boursson as it is the entry point for the southern end of the station. The lever is provided for local control when the point is released for shunting purposes. 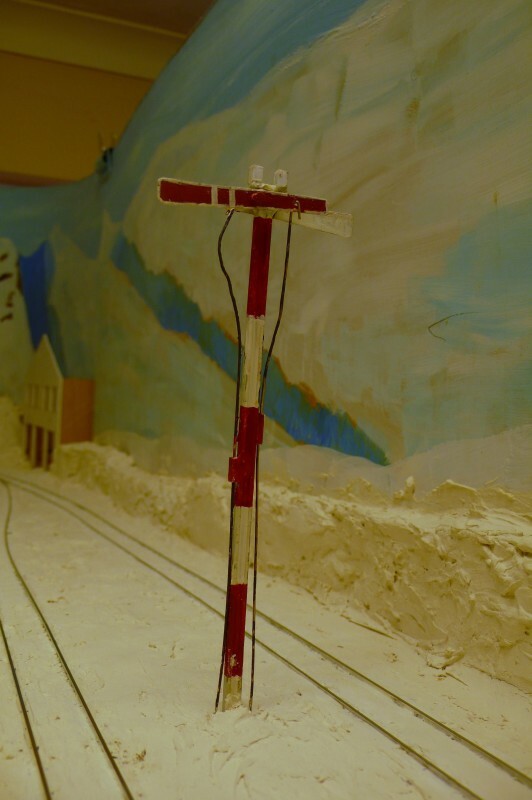 A casing containing the wheels necessary to operate the point from the frame has been provided on the near side of the line although the wires are missing. The rotary locking mechanism was also contained within the housing. As in Britain there were many variations in the equipment preferred and provided by the pre nationalisation companies. The Bavarian railways used the trapezium lock whereas many others preferred the hook lock. The casing on this point has been left open to show that the AFK follows Bavarian practice. The actual activation device is the obvious chocolate block terminal in the foreground which is directly attached to the copperclad sleeper functioning a s a tie rod. This is a large complex layout and the individual pieces of it are designed to operate as simply as possible to avoid unnecessary problems. 6. The two wire system required balancing weights to be inserted into the wire runs to counteract expansion and allow for adjustment. This is a unsophisticated home made facsimile at Boursson with a simplified wire run roller behind it. No wires are fitted. There is enough to damage without it becoming too complicated! Previous attempts to replicate these weights elsewhere, using plastic, have ended in disaster resulting in these less detailed but more robust metal versions. As I observed earlier signals seem to be regarded as an optional provision by many modellers, whether they prefer NG or SG railways. Usually they are missing or simply marked by static models, often wrongly sited. Even where they can be made to work many modellers refrain from using them. As some-one who had a second, later life, career as a signalman with Network Rail there was little chance of these conditions obtaining on the AFK! One of the more interesting aspects of fabricating continental specimens is the diverse methods by which the signal was activated and the variety of meanings displayed to the driver. The AFK has adopted French practice in that the intermediate stations are laid out for VDU (Voie Directe Unique) working. There were many variations upon this basic scheme but in essence it boiled down to a train taking the straight route through the station unless there was a need to divert it into a loop. In similar circumstances British practice was for the train to take the left hand route irrespective of whether there was a need to cross a train or not. The VDU system therefore assumed that both sides of a loop were effectively available for bi-directional working although only one departure signal was provided. Due to space constraints many AFK stations do not have their full complement of signals modelled, although they are accounted for in the rule book and numbering sequences. Boursson, for instance, lacks a down ES but the station has been selected to illustrate the basic principles as it is the most complete of the installations on the lower part of the line. The original intention was to use standard SNCF Verlant code signalling in the Kasatritikakamparoj and this is (almost) how Boursson is arranged. Originally the Altingablecaŭtoj stations were scheduled to receive French pre-nationalisation examples but some German practice has been incorporated at Ithilarak and it now seems likely that room will be also be found for Swedish and Italian examples. The signalling at the minor intermediate stations is mechanical but the AFK also possesses three colour light installations at Lacono Cittavecchia, Urteno and Fenditavalat. Although this is probably over egging the pudding for such a small railway some European NG railways did use colour light signals. The system at Lacono is only partially installed at the moment, that at Urteno does not exist at all and the small Fenditavalat scheme is as complete as can be shown on the layout. This amounts to one signal! The German system used upper quadrant arms from the earliest days which operated in a similar manner to the British upper quadrant home signal. The German system was a speed signalling system however. Where there was a choice of routes a second arm, which stood vertically along the post when not required, was lowered to present two arms to the driver indicating that a slow speed route had been selected. The driver did not need to know where he was going (and therefore could easily travel over unfamiliar territory) but simply slowed the train. There were also distant signals which relayed the positions of these arms to the driver. The signals and points were activated by a double wire system which was looped around wheels on the signals and levers. The levers had a 180 degree throw to operate the equipment. The French system combined elements of route signalling and speed signalling. The signals were often (but not always) boards of different shapes and colours which rotated parallel with the track when they were in the clear position. This meant that they were invisible to the driver rather than giving a positive clear indication. Some signals indicated the need to slow down and others showed that a diverging route had been selected. In many places rodding and signal levers similar to that used upon British railways was the normal provision for their operation. SVV-AFK: The AFK method of working passing stations. The AFK mainline is single with passing loops. Each of the three countries developed its individually preferred methods for preventing two opposing trains from entering the single line at the same time. The instruments which provided this security are far too small to replicate on a model railway, other than as lumps of plastic in a scenic role. It could be argued in any case, where one is operating single handedly, that any consideration of such methods is academic as far as modelling them is concerned. The layout owner/driver/signalman knows which train has priority and is unlikely to deliberately stage a crash between opposing trains. ​ The working of SVV-AFK stations is regulated according to the directions contained within the AFK Instructions for Working book. This is effectively a cross between an extract of the Rules and a Sectional Appendix. The following extract shows how the AFK works the single line and gives an indication of the hardware provided at each location. The Instructions do exist! The AFK is a complex layout and many working methods have developed over the years to keep traffic moving. The booklet formalises common practice and also prevents one or two liberties being taken! Some of these latter short cuts will now result in a Form 1 if anything goes wrong. "Please explain....."
To some extent I have manipulated the continental systems to suit my preferences but most of the French influence has been obtained by referring to Histoire de la Signalisation Ferroviare Français (A Gernigon, Vie du Rail, 1998). I would not attempt to suggest that the AFK signalling system was an accurate portrayal of any real system but rather that it has been influenced by prototype practice. I suppose that I could cite Rule 1 (Its my railway etc, etc.) but that would be the easy way out! What I have attempted to show as the standard AFK installation at an intermediate passing station is derived from French voie unique (VU) or single line practices. There were many variations in provision, all of which are outlined in the book, along with representative diagrams. One problem is that in some circumstances stations were laid out on the Regie voie directe (VD) principle (i.e. taking the through (straight) route) and others were laid out on the Regie de la voie de gauche where the left hand route was always taken as in British practice. VD translates into Thalnian as sola viva vojo so what we have is the SVV-AFK system. 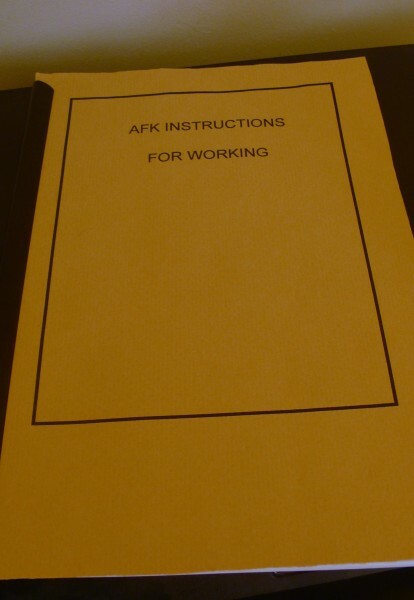 The working of SVV-AFK stations is regulated according to the directions contained within the AFK Instructions for Working book. This is effectively a cross between an extract of the Rules and a Sectional Appendix. The following extract shows how the AFK works the single line and gives an indication of the hardware provided at each location. Unsurprisingly none of this equipment is functional given its small size, but it is provided to indicate that this is an important regional railway operating an intensive service using relatively sophisticated signalling. 7. Boursson's home and distant signals (the Enirosignalo and the Antaŭsignalo) are the standard designs used by the French railways after 1934 when the Verlant code was adopted. Prior to this date each French company had used its own signalling systems which generally followed similar conventions for the main running signals, albeit that there were differences in the detail. There was much greater variation in the designs adopted for subsidiary signals, hence the need for a unified code. The red and white "carré" was the absolute stop signal and the yellow "avertissement" was the distant signal. Close observation will reveal that the correct painting conventions have been used with the red and white squares offset with a border in the contrasting colour. The yellow diamond of the distant has a black and white border placed around it. With the red board visible to the driver a complete stop was required. It was usual to place the distant above the home in contravention of British practice. 8. The ES has swung round to stand parallel with the track. In this position it is invisible to the driver indicating that it is clear. On the SNCF this arrangement showed that the home was off but that the next stop signal was at danger. On the AFK this interpretation has been slightly adapted. With only the AS visible the AFK train can proceed into the station at reduced speed but it can either expect to be held at the FS or that it will run into the PFT (loop). 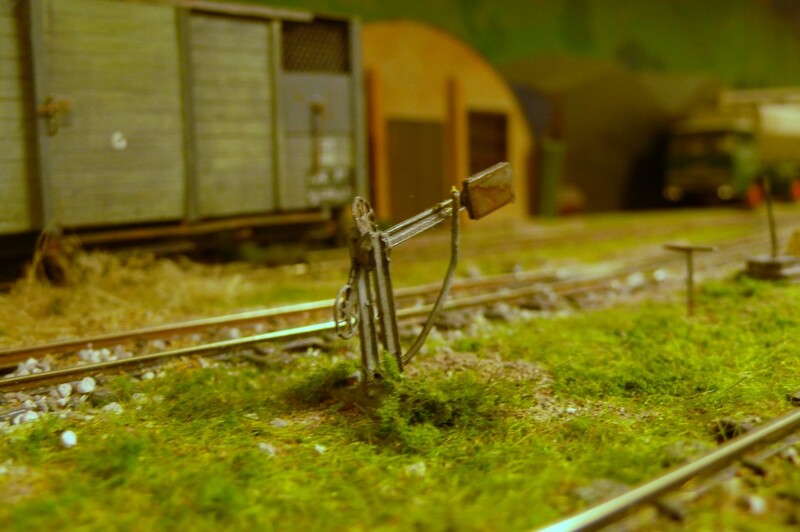 The signal post is built from a 4mm scale MSE kit of the lattice base for a bracket signal. It was reasonably common in France to find that the post was painted with a red band to indicate that it held a "carré", the absolute stop signal. The signal "numbers" follow Germanic convention in that a letter is allocated to each running signal. This is signal Q and the Rx represents the distant signal for signal R. On the AFK the letters have, as far, as possible been arranged to follow sequentially from the previous station to avoid any confusion or possible duplication. 9. Both the signals are now "off" which in AFK terms indicates that the train will run along the RT (main) and that the FS is also "off". To be critical the post should be taller or the ES should have been mounted at a lower level because the AS would not be located on such a long unsupported rod. The guides for these two rods, cut from small diameter brass tubing are visible at the top of the post. Inevitably the distant has been knocked and so it rotates with a wobble! The bucolic construction methods are also apparent in this reversed view. 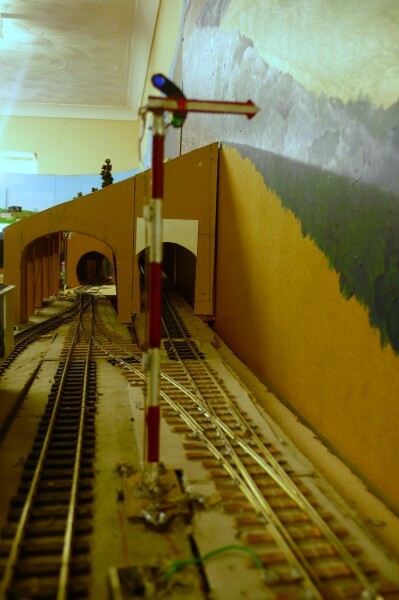 The signals were fitted as small pieces of metal to which the boards were later attached. I suppose in reflection that these metal arms should have been cut to the same size as the finished boards thereby making them less conspicuous. 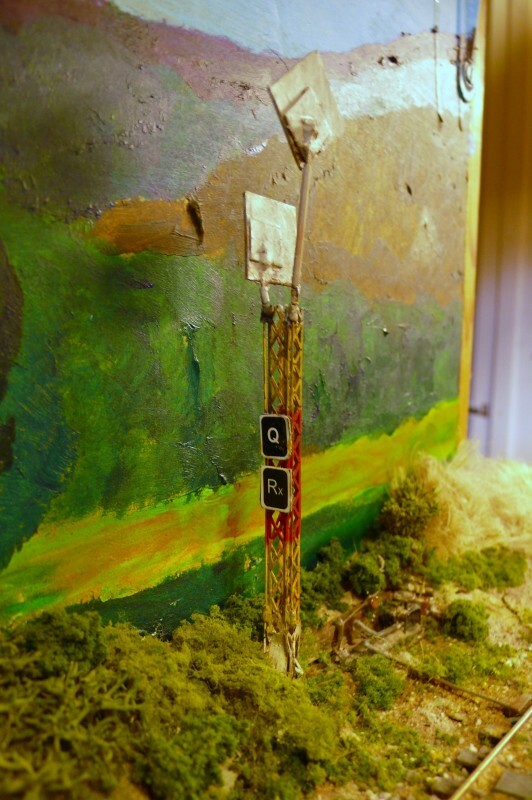 The actual signal boards themselves were cut from styrene sheet which allowed them to be painted before construction. There are eight areas of contrasting colour on the home signal which makes it difficult to obtain a neat finish! 10. The block 'ramp' has been modelled and is seen here in the track. This is activated by a magnet on the loco which sends an impulse to the block instruments at the far end of the section causing their indications to change. These small casings typify German practice whereas the French used long perforated ramps similar to British AWS ramps. Also visible behind the signal mast is the Aubinage mechanism. This automatically replaced the signal to danger as the train passed. It was worked by the treadle on the track which was depressed as the train passed releasing weights to turn the signal back to danger. This type of system was not used in Britain but it was used in the colonies to similarly return typical British semaphores to danger. 11. From a modelling point of view operation is kept very simple. 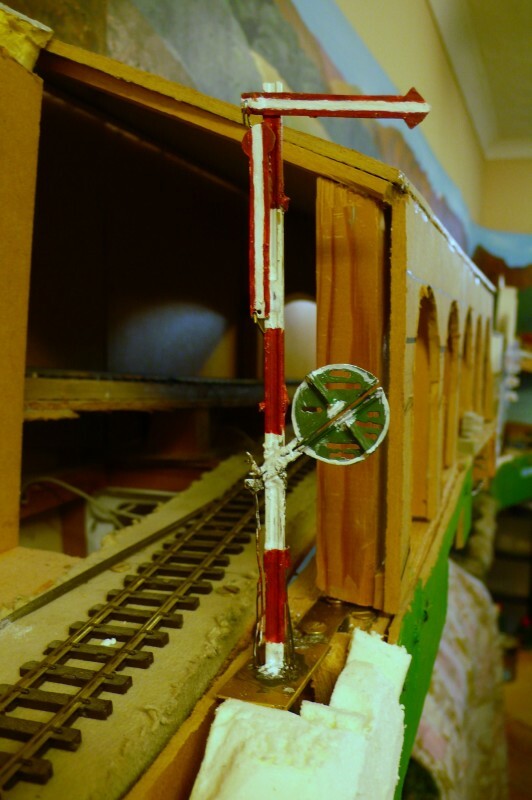 Push or pull rods underneath the signal project through a hole cut into the layout fascia working cranks placed on an extension below the signal post. The cranks rotate horizontally rather than vertically, as is usual with semaphore arms. The chocolate block connectors used as handles are easy to fit and easy to use. The standard siting of these signals was in the middle of the station so I suppose that some semblance of the interpretation was required in that the loco had to run past the signal to pull its train into the loop. A second reason can also be contemplated. If the signal had been at danger upon the train entering it was now behind the loco. Placing the semaphore arm upon a tall mast meant that it was therefore easier to see when it cleared. it was also common practice to place both arms onto a single mast, as here. 13. The AFK's Boursson installation diverges from standard practice in that it has three position sémaphores. During the nineteenth century the signals were sometimes apparently worked from the base of the mast, rather in the manner of a HornbyDublo or Triang signal! The staff simply walked to the signal and adjusted the aspect. This obviously was only the case in rural areas on single track backwaters with slow speeds and an infrequent train service. In these situations the PLM semaphore could display three positions, although they had all been modified to two position signals by the beginning of the twentieth century. There was one exception though. The CF d'Herault, a subsidiary of the PLM in the south of France, retained the three position version well into the twentieth century. The AFK interpretation of this 45° aspect is that the route is set out of the loop and that the train can depart at a reduced speed until it is clear of the points. 14. The signal drops almost to vertical in the full clear position which on the AFK indicates that a train can depart from the RT (main line) with no speed restriction. The rather weird shape of the operating wire bears testament to the amount of fiddling required on the model to obtain this indication. On the prototype the signal was operated by the continuous wire which looped around a wheel set into the top of the post. The clear and caution positions are held by the natural friction in the model operating mechanism, which in the case of the signal mast is obtained by passing the wire through tubing to prevent its shape from deforming. The mast displays a different type of colouring from the ES as there is no distant signal indication available at this signal. 15. One interesting feature of these signals that I wished to capture was that they were illuminated at night time by a single petrol lantern. As was often the case with continental signals the red aspect showed through an aperture in the blade rather than from alongside it as was British practice (see photo 12). Whilst signal R appears, to all intents and purposes, to be a lower quadrant semaphore familiar to British eyes, the converse signal T had to have the spectacle plate reversed so that the clear indications were above the arm. I could not resist fitting a LED and providing blades with coloured plastic spectacles to emphasise this arrangement, although the AFK makes not attempt whatsoever to run in "night time" conditions. Fabricating this "reversed" blade from solid metal took a number of attempts to make sure that the aspects aligned with the lamp. 16. When two trains were crossing in the station it would be possible for both arms to be off simultaneously creating a cross like aspect. As they were three position signals both blades obviously cannot be fully cleared in this situation. Although the basic provisions of the VDU system have been adopted the signals giving the indications associated with the AFK's methods vary quite considerably. 17. Because of it's location it is difficult to get a good photo of Breĉo de Glissent's up FS which is based upon a CF du Nord Latrigue sémaphore rather than the PLM one. The prototype's interpretations were identical but the arm was characteristically slotted as here. The model arm was the very devil to construct! It was soldered together from a number of components, many of which became unsoldered when the iron was applied elsewhere! The arm, as usual with French prototypes drops to almost vertical when clear. The sharp bend at Glissent has required that the down FS (not modelled) stands on its own post at the other end of the loop. These signals simply display two aspects indicating that a train can proceed. When there are two up trains waiting to leave rule TW8 should ensure that only one trajnaĉefo sees the baton ensuring that the correct train leaves. 18. Ithilarak's up departure signal is based upon a CF du Midi "PD" signal (carré de cantonment) introduced in 1907 to replace the original 1902 "banjo" signals. The Paul et Decousso variation replaced the heavy casing of the banjo signal (the idea was imported from the US) with a glass cage. They were an early attempt at power signalling and were manoeuvred into position by electromagnets operated by the passage of trains. Unfortunately the current draw was very high and could not keep the signals in the "on" position for long. The standard practice was therefore for them to stand at clear only reverting to danger once a train had passed. The AFK version usually stands at danger. 19. The "board" was made from red silk (!) and a light shone through a white casing from the back when the signal was clear. There were two pieces of silk which folded up like a butterfly's wings in the proceed position. The model obviously had to be lit which meant that red celluloid was used to represent the silk and some translucent white plastic formed the back of the case. Actually constructing and actuating these silk screens was relatively easy, although the operating mechanism (obviously worked by one rod) is very bulky and lies under the white plastic sheet. The fun came in constructing the glass case which was soldered up from 12 separate very small pieces of brass. In a familiar theme as soon as one piece was soldered another became detached. Eventually it was completed and then needed painting and 'glazing', another difficult chore. The case is removable for remedial work and is held in place by a couple of pins. Its delicacy ensures that track cleaning in the vicinity is carried out carefully. 20. The above signal's counterpart is a Royal Bavarian Railways home signal. Whereas the standard German hauptsignal had an arm which terminated in a ring the Bavarian variant sported an arrow, as here. These signals were similar in operation to a British upper quadrant home in the stop and clear positions, although the arm pointed to the right as German railways ran right handed on double track. The signal is lit with a LED and the red aspect shows through the blade. 21. To be strictly accurate two signals should be provided here with a second one showing two arms for departure from the loop but the AFK makes do with one, in compliance with VDU principles. In any case there is no space for another one! As an aside departure onto the rack section (into the right hand bore) is not authorised by a fixed signal but is given by the stationmaster's baton. The rack branch works by telephone block. In another faux pas the proceed aspect should be white for a pre WWI signal but it displays the later green here. 22. The unusual feature of the Bavarian home was that it could swing to a vertical 'Ruhe' position displaying a blue light. 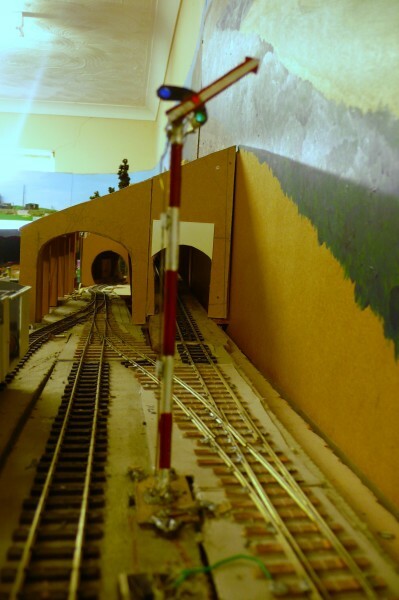 This showed the station staff that the hand worked points leading into the sidings were released from the signal's locking and that shunting could take place. The points for the goods loop (at the far end of the avalanche shelter) and the station entry points can now be worked by hand levers. When a train approached the signal was placed at danger to indicate that the hand points were locked in their correct positions and that the signal could be cleared. 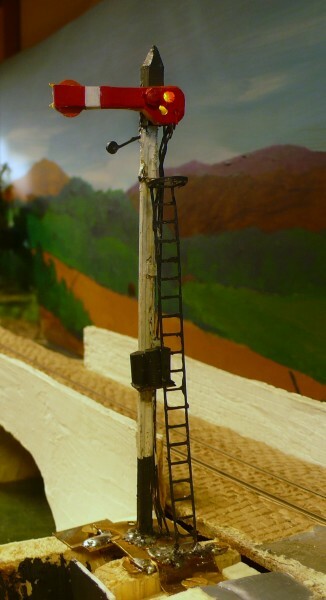 The mast, which is made from a piece of 32mm NG rail, is painted in the characteristic German manner. Itnilarak's down ES had to be removed from the layout for repairs. 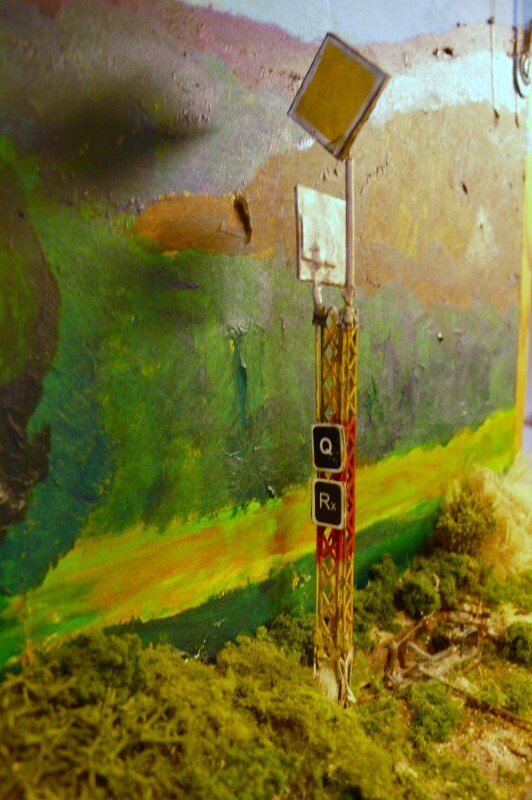 These have been completed but the signal has not been replaced to allow scenic work to continue without damaging the signal again. It is shown here temporarily clipped onto the lake at Ospicio. In this photo the signal is displaying the stop aspect. The eagle eyed will note that clear in the home spectacle is given by a white aspect as was common in pre WWI signals. The lower arm, which is parallel with the post, will display green when lowered and the distant is coloured green and displays green for caution. The main arms are based upon Royal Wurttemberg signals and are slatted and painted in red and white halves. The distant is a bit of a fudge in that its face is based on Bavarian practice but it operates in a conventional manner. As usual the arms were the most difficult part of the signal to construct. 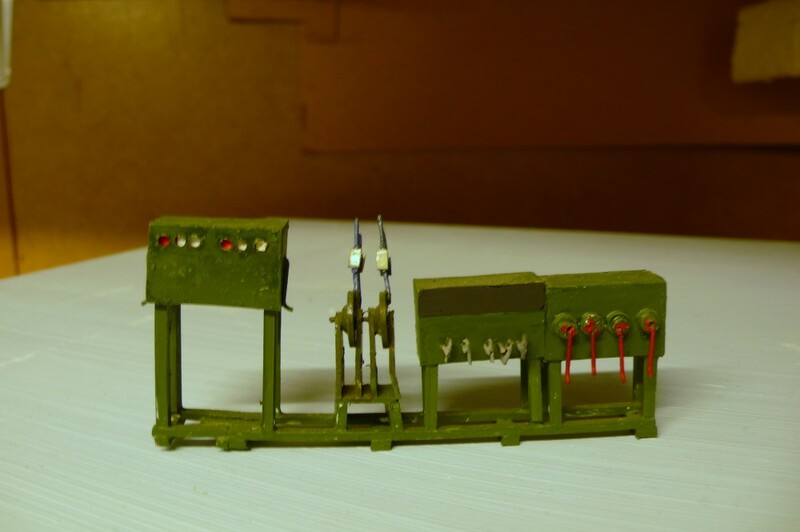 The two lattice posts were made from MSE kits, one for 4mm scale and the other for 7mm. Needless to say both have been 'belted' a couple of times. This is the Bavarian equivalent of the down FS. It is incomplete in that spectacle plates need adding to the arms as well as other details. One distinguishing feature of these signals was that the distant arm was always placed on the main mast rather than standing on its own short separate mast. In all honesty there should be a greater vertical separation between the distant and home arms but I salve my conscience in the knowledge that the sighting of these arms is restricted on leaving the tunnel just to the south. The avalanche shed is still awaiting its south portal but the fearsome grade of the Vulpafaŭkangulo is quite apparent, although it should be noted that the line behind the main is the rack branch which will eventually be hidden at this point. 26. The ES displays the 'take loop' indication with both arms showing. The painting on the lower arm obviously needs some attention. On the prototype as the upper arm rose the lower arm fell at the same time but on the model the two are moved independently. I once arranged an N gauge version to achieve this simultaneous action, where no single arm clear could be given. In line with AFK locking practice the distant "cannot" clear in conjunction with this display but it could on the prototypes. The upper home arm ends in the characteristic Bavarian arrow whilst the lower arm ends in a circle, similar to the standard versions. Both should have been of slotted construction. I could not face another episode of this ~ life is too short, so I substituted them with the enamel versions that replaced the originals in later years, although they are painted in the old style. 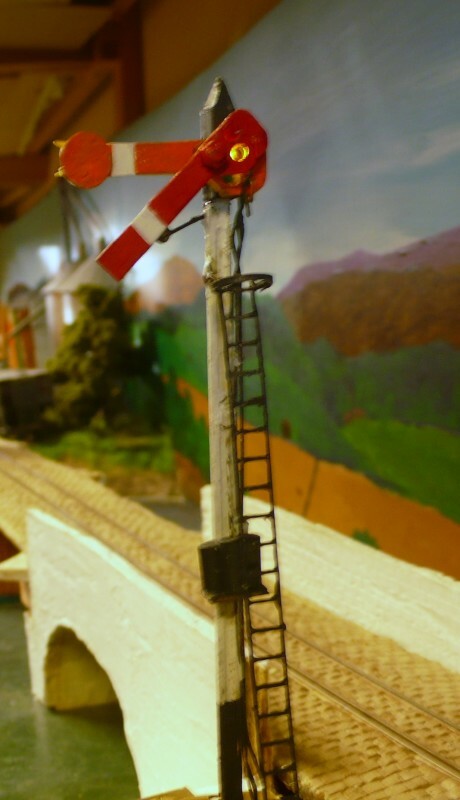 The lower arm was placed behind the signal mast in the true Bavarian versions and I did consider setting it up in this format. Many of them were moved in later years to the front of the mast, at the same time, I suspect, as the arms were replaced. The gradient is sufficiently severe at this point that a "No dead stop" board will be provided indicating that heavy freights should crawl towards the signal when it is on in the hope that it clears. 27. The Bavarian distant folded back upon itself along a 45° axis making it interesting to model, especially as both halves move simultaneously in opposite directions. By adding an arrow shaped lip to the edges a positive display was obtained with the arm pointing upwards at nominally the same angle as the home signal. 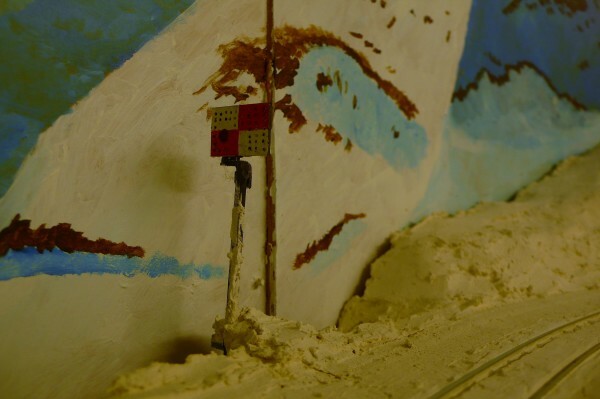 The main problems with making the model were to get the slats parallel with each other and to paint it. I am still not happy with this but there are so many angles and projections that it is difficult to obtain a neat finish. 28. Most of the remaining semaphore signals at the moment are variations on a theme. This is the Ospicio d'Helcaraxë RS and AS. The home signal is modelled in the style of the CF de l'Est and is an oblong rather than a square. There is only one red light however whereas the carré always displayed two reds. (The single light is an AFK adaptation.) The painting style is that used by the l'Est which was adopted under the Verlant code. The green and white colouring on the distant reflects the old principle of green representing caution. The standard practice was to mount the distant as an oblong in the same orientation as the home board but I had not realised this when the signal was constructed. In the square diamond orientation it indicated that there was a reduced braking distance to the next home signal. The holes were drilled into signals placed at exposed locations in an attempt to prevent the wind from blowing the boards into a false clear position. This problem was apparently one reason underlying the Midi's experiments with the banjo and PD signals. 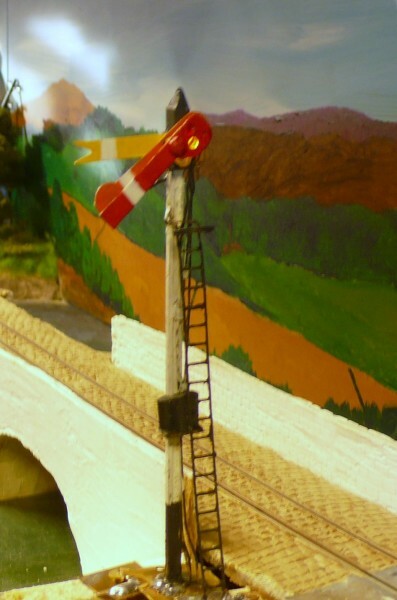 The signal has been mentioned before because it stands at the top of the long pull from Relforka's platform and marks the end of the collar work for the engine. It is therefore known as the "Star" in reference to the Blea Moor's distant on the Settle & Carlisle which was known by loco crews as the Star of Bethlehem. It stands on the wrong side of the track for sighting purposes. 29. Caladonno's ES stands surrounded by snow on the viaduct outside the station. No distant has been provided at this remote location as there is only one scheduled crossing per day at the station which functions mainly as an intermediate block post. As at Ospicio holes have been drilled into the board which displays the simpler painting style preferred by the CF du Ouest. It is possible that an elevated wire run may be attached to this signal so that it can be easily accessed in winter. 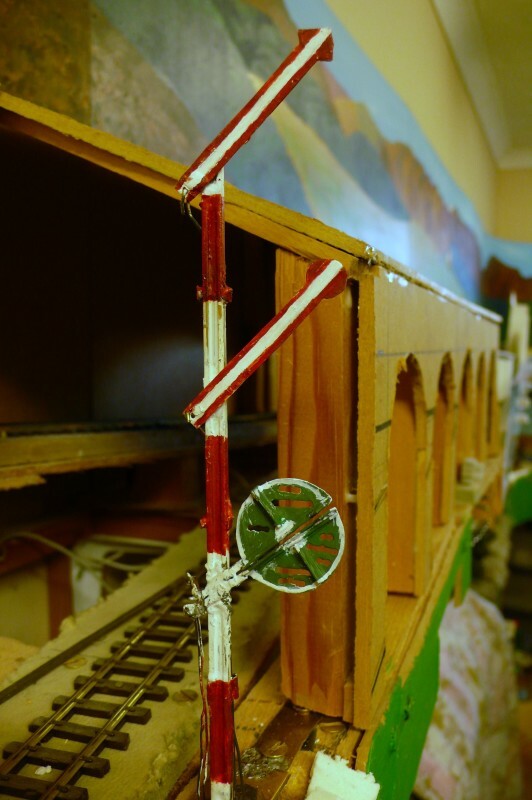 In actuality the signal was attached to the viaduct when this was removed from the layout for its stonework to be applied. It is worked by a crude rod fitted onto the undetailed backside of the viaduct which is worked through the sky above Boursson thereby providing a concrete example of the mythical "sky hook"! 30. Caladonno's FS signals stand in the middle of the loop but in this case are patterned after the examples used on the CF de l'Est system. Once again the weird and wonderful shapes of the operating wires reflect the fact that the arms almost drop into the vertical position at clear. 31. The enirasignalo on the north side of Breĉo de Glissent follows Italian practice, although it still awaits its identification plate to show that it is signal L. The information about these signals was taken from the web. At first sight this might be taken for a typically British lower quadrant signal but a closer inspection will reveal many deviations from UK standards. In this photo the signal stands at danger but the night time aspect is displayed through the blade, as was common on the continent. There is no separate spectacle glass alongside the arm as was usual in Britain. and the entire front of the arm is painted red, apart from the white band. 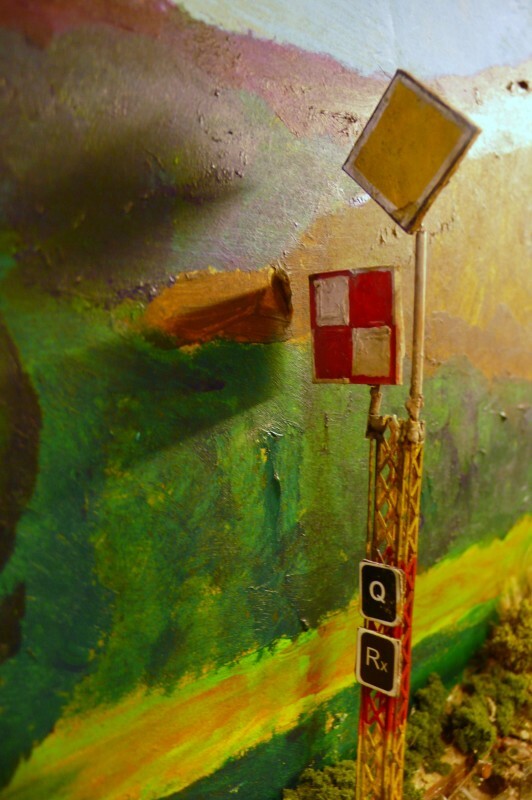 The signal lamp shone through the post, the top of which was painted black. The high level counterweight (which is a dummy on the model) operated the arm by a complicated linkage. As far as I can ascertain there was simply one counterweight even where multiple arms were used. The signal is worked by electric motors, which can be seen on the lower part of the post. There were a few examples of this type of activation on the British SG, although they were rare. This method has been selected for signal L because it stands across the river from the station, alongside the main road, and it would be difficult to arrange mechanical activation. Standard Italian practice appears to have been to place the ladder in front of the signal rather than behind it. 33. With the home and siding signals off the distant indicates that the route is set to the main but that the section signal is on. This was given by a night time indication of yellow, as was the "take siding" indication. The light illuminating these aspects shone through the post and then through the blades of the respective signals. In the case of this particular signal, as in the prototype, this meant that certain apertures were empty, so that the colour in the spectacle plate behind them could be projected. The take siding arm has no colours in either opening. One problem with this was that when all the arms were "on" the light shone through the yellow of the distant and the red of the home to create an 'orangey red', as does the AFK's example. The Italians resolved this problem by introducing an open aperture in the distant's caution and the home's clear indications. When the home was off but the distant was on, a separate yellow spectacle plate, worked by a pin and slot, was drawn in front of the lamp to give a yellow light. The red therefore shone more clearly at danger. 34. With all the arms off the green aspect shines clearly through the various apertures. Whereas Britain began to replicate these indications in colour light signals by using separate lights the Italians preferred to use the searchlight system whereby the different aspects were given from a single lens. They were selected by a motor controlled spectacle plate built into the metal base of the signal. By adding extra heads to the signal additional indications could be given. A three headed signal could theoretically display nine aspects, ranging from red/red/red to green/green/green. As an ex signalman I find it incredible that a proceed aspect could potentially be given from an individual signal (as opposed to an array of arms) which included two reds in the combination! 35. Correspondence on various web sites raised the thorny problem of distant signal provision upon the approaches to stations. The French VDU system seemed to exist quite happily without distant signals in any shape or form. After some consideration the AFK has adopted the German Kreutztafel as the effective fixed distant indication that a train is approaching a station. 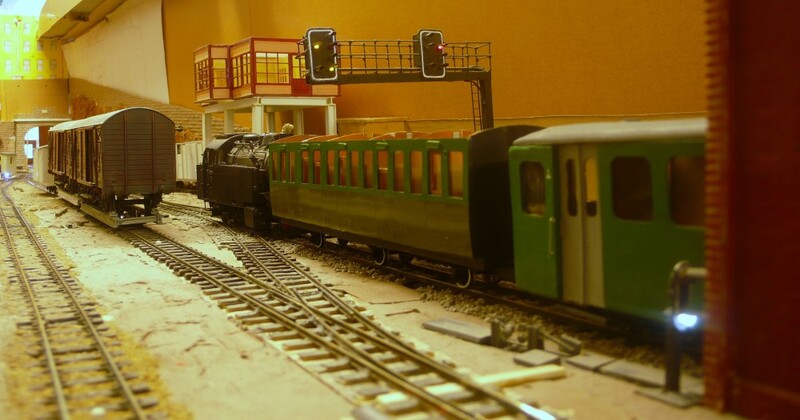 Given the necessarily foreshortened distances common upon model railways there are actually only two examples on the layout, where they can sensible be placed at some remove from the station. The signal itself is simply a fixed enamel sign with a black cross on a white ground. 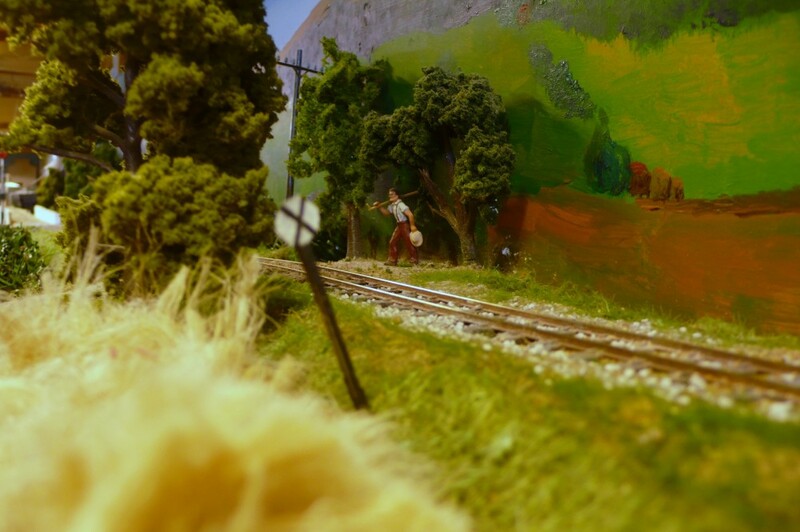 This one stands on the approach to signal L illustrating the unprototypical mixture of systems used on the layout. In contrast to Britain, some busy continental NG railways were signalled by colour light signals. The Rhaetian operated such a system but colour lights could also be found in Portugal at Porto Trinidade during steam days. The AFK has used French SG colour light signalling principles as the basis for its own 'home brewed' system. Prior to 1934 it was standard practice in French colour lights to display caution with green lights and proceed with white lights. The stop aspect was given by two reds although the AFK only uses one. Some signals contained so many bulbs that they were nicknamed "Totalisers" after the display boards at greyhound tracks which were popular at the time. The decision was made to use pre WWII principles on thr upper part of the line, effectively covering Fenditavalat and Urteno, and more modern principles at Lacono. The latter amounts to the use of the modern aspects of yellow for caution and green for proceed. 36. Signal S at Fenditavalat is one of only four signals in this small sinstallation. In all probability it would most likely have been a semaphore signal but for the fact that it needed to indicate the route selected, as per the prototype. This was most easily achieved on the model by using microswitches and LEDs, although one semaphore predecessor on the old layout was operated with slow motion stall drive point motors. 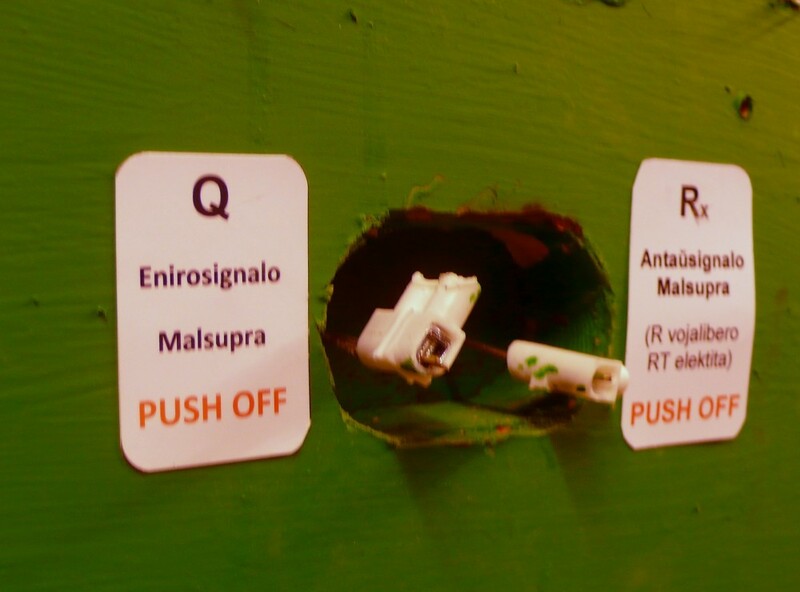 The microswitches indicate the position of the point blades at Calodonno which is a few feet away in reality. 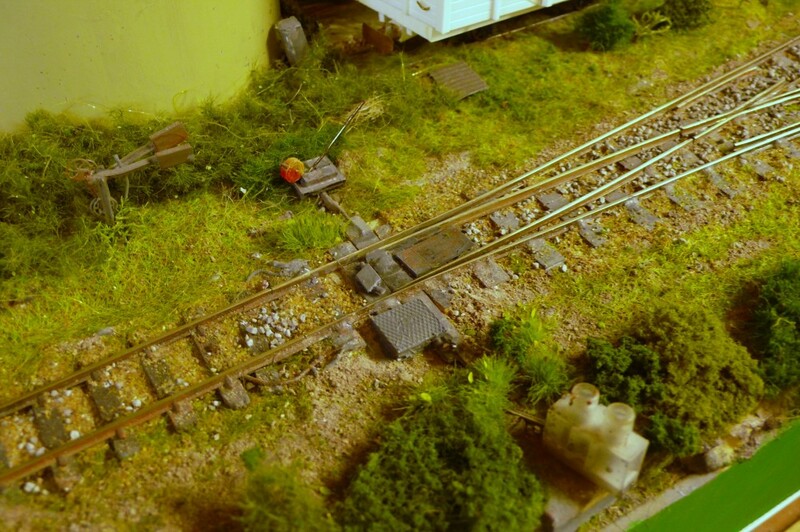 The main area of concern is that the points could be set to the Rivabordo fiddle yard cassette which cannot clearly be seen from the Fenditavalat operating position. If it was not connected the train would then fall onto whatever equipment was below at Lacono. The clear aspects also indicate that the traction circuits are connected to Fenditavalat as these have to be switched between Fenditavalat, Caladonno and Ospicio on the other side of the room in a complex 4 pole double throw arrangement necessitated by their close proximity on the model. It is easy, if the wiring diagrams have not fully been thought out, to end up with a "black" signal. 37. The yellow is used as a shunting indication on this pre 1934 signal. It shows that the traction circuit through the city gate is attached to Fenditavalat's controller and that the move will not stop when it reaches the switchable traction circuit. The four vertical lights above the main signal are a route indicator based on principles dating back to the earliest days of French signalling. It is not lit as no route has been selected. 38. As noted, the pre Verlant code French colour lights used white for clear. The running line signals are pulled up by toggling between a pair of DPDT switches. One selects on/off and the other shunt/run. The white over green shows that the mainline is selected and that the horizontal whites show that appropriate traction circuits are connected. The signal body is built from brass sheet and tubing which has a diameter to accommodate the 3mm LEDs. The relevant wires are threaded up the mast although this can be a tight squeeze. Seven wires were needed in this instance. The return is connected to the base plate with one arm on the LED being bent into the tube to make the return connection. Make sure that these are all the same polarity otherwise some lights will never work! Also remember to connect the resistor into the circuit before testing otherwise the LEDs will blow. Do not ask how I know these things! 39. The two horizontal greens indicate proceed at caution. In this case the points are set to Caladonno's loop as confirmed by the two vertical greens on the route indicator and a different traction circuit, as shown by the horizontal greens. In reality this indication would not be used as Caladonno is supposed to be roughly five kilometres distant. 41. Little progress has been made to date with the Urteno signalling scheme but a signal box has been built. It was common to find specialised signal boxes contained within the station buildings in continental practice, where they had not been placed upon the platform. 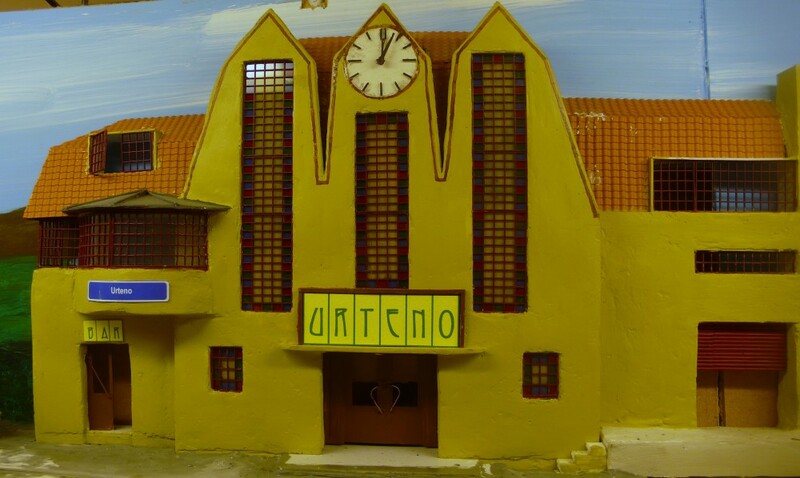 The Art Deco station at Urteno is based upon that built by the French at DaLat in Vietnam. This is by no means an accurate copy and it has been adjusted to suit the AFK's needs. During construction it was decided to incorporate the semi circular box seen to the left of the main hall at first floor level. 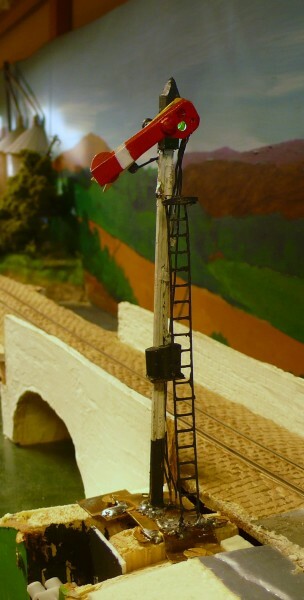 The projection gives the signalman a good view of the station and the adjacent lifting bridge which is also under his control. 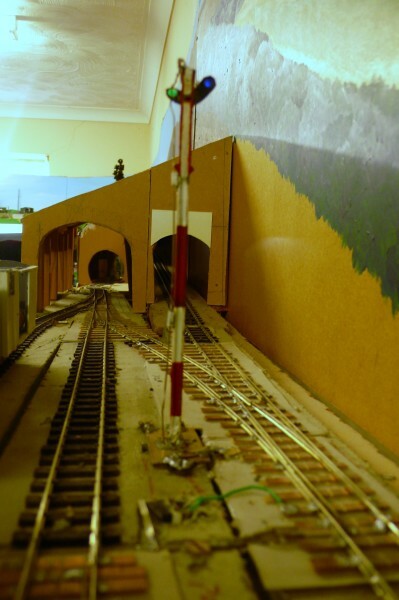 After a lot of deliberation during the early stages of design and construction of the layout it was decided that Lacono needed a fully signalled layout because of the station layout's complexity and the amount of traffic using it. This was by no means a foregone conclusion because some continental NG systems operated complex layouts and intensive traffic by simply using hand thrown points. (The Yugoslavian 760mm lines are a case in point. During WWII the Germans were apparently surprised that such a complicated sytem carrying heavy traffic was operated in so primitive a manner!) 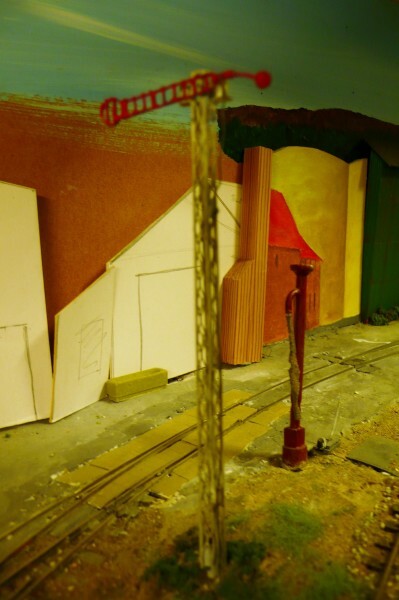 A decision was made to incorporate a stand alone box, rather than claiming that it was not modelled because it was in a room in the station buildings. 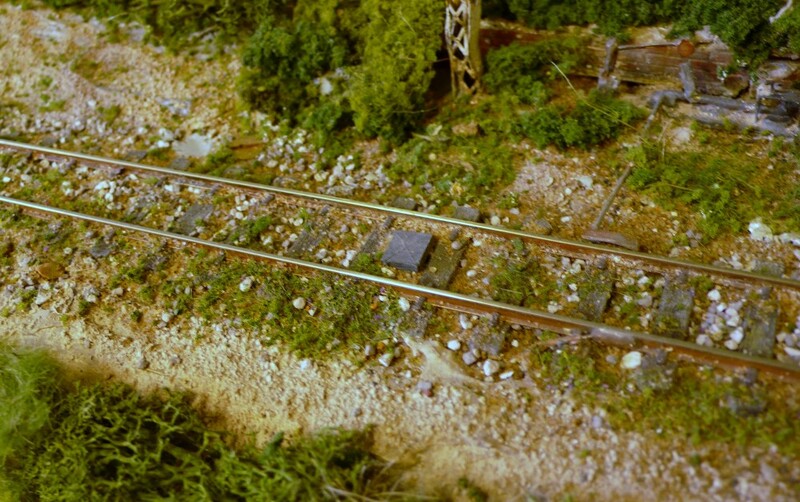 Given the pressures of space the only location that could be found was over one of the sidings at the rear of the layout. The model was cut down from a generic model that was once marketed and placed on top of a set of girders. This produced a rather bland appearance and so an overhanging section was cut into the box front, as was sometimes done on German boxes. Little more progress has been made at the moment but it is intended to eventually include interior detail and a replication of a Bruchsal type K frame. The type Ks were conversions of the former totally mechanical frames originally installed and it is intended that the original here was a type G.
The box operates a version of Bahnhofsblock and is designated LaC box, in line with German practice. It works in conjunction with two subsidiary boxes at the station. Gasafabrikatastrato box stands in the Gas Works Street sidings. These form a small marshalling yard at the mid point of the AFK. The "box" is a simple corrugated iron shed but some attempt has been made to incorporate Germanic features such as the rounded roof. Access to the yard is directly from the mainline as there is no space to provide a headshunt. The relevant point is set to the yard and locked by a slot form GfS cabin whenever it is required for shunting. 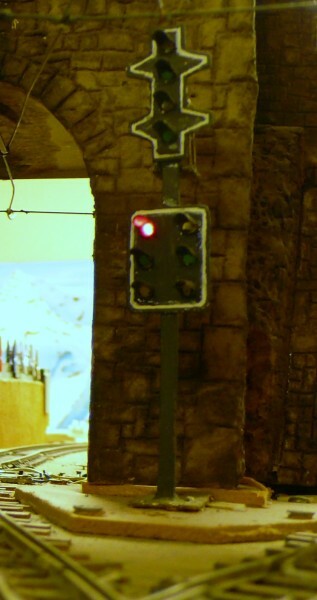 The box also controls the exit ground signal from the yard (showing white to the left of the loco). All other pointwork within the yard is worked from levers adjacent to the point. As was quite common in the Bahnhofsblock installations this minor box mainly operated slots on the main box's signals to prevent them from clearing whenever the yard had been released to local control. KaS box has always been rather photo shy but it appears here in its raw plastic state squeezed in between the railcar and the trolleybuses. 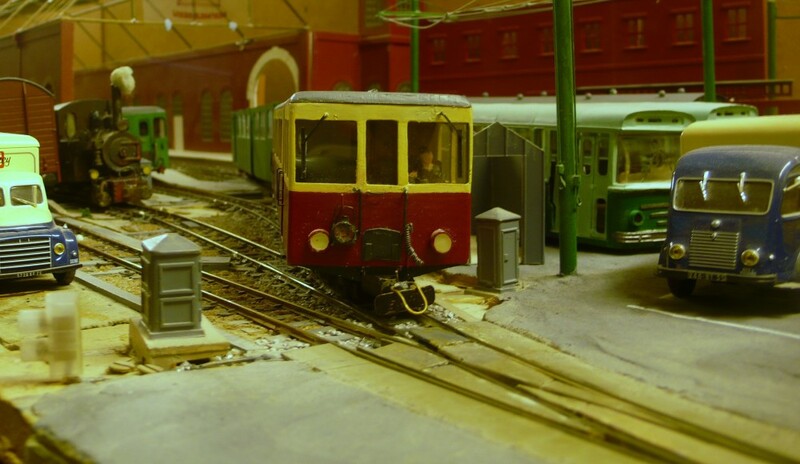 In British terms it is simply a gate box with the signalman having control over the barriers (not yet installed) which drop down over the Karushnastrato, one of the main streets in the city. The box operates no signals but works slots on LaC box's northern entry and exit signals. 45. The platform end starters (signals L and M) have been placed on a gantry. They are typical of continental signals in that they display multiple light aspects in contrast to British colour signals which simply showed one light (or two for the double yellow advance caution). The AFK examples are finished with white lining in SNCF style. 47. The shunting signals are usually at ground level and can be arranged horizontally or vertically where space is limited. These display blue for danger and white for clear. There is no route indication as the shunt moves travel at low speed. The one to the left of the loco (dd) displays clear whilst the one under the control of GfS (bb, at the left) is exhibiting blue despite appearances. The blue should really be a purple but, as I noted earlier, there were no purple LEDs available at the time of building. The shunting signals have all been given lower case repeated letters in this AFK installation although I am unaware of any prototypes that follow this convention. 48. The actual aspects displayed by these AFK signals are somewhat home brewed although derived from the French system. The yellow over green aspect at signal C indicates that the main (straight) road is set and that the next signal is at danger. The lower yellow shows that the road is partially occupied and that this is therefore a shunt move. French practice did not include subsidiary arms to indicate shunt moves where a home signal was provided, unlike the typical British arrangement. 49. In this case the train is signalled away from Lacono's main platform (number 3) as shown by the vertical green aspect on the left of the gantry. The multipliicity of shunt signals is apparent. Passengers disembarking onto the very narrow platform have to take care that the carriage steps are clear of the signals. 50. The equivalent clear aspect for the adjacent platform (2) is a green diagonal pattern to the left. This indicates to the driver that he will diverge to the left and that he should depart at reduced speed until he is on the mainline. 51. 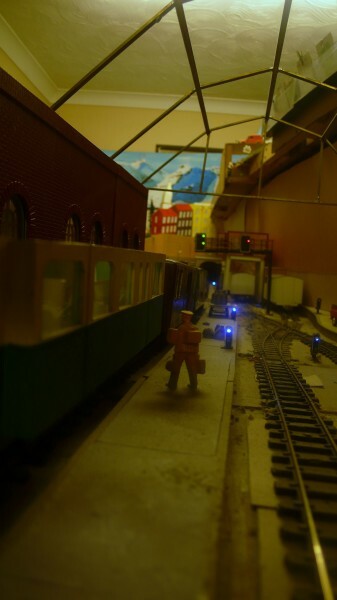 The two diagonal yellows to the left show the driver that the next shunt signal (cc) is clear, the points beyond are reversed and that he is routed into the carriage sidings/depot at Aspargo. Signal rr in the right foreground has dropped to blue despite its apparent off indication. This signal is necessary to protect the mid yard crossover in the foreground. 52. The yard signal (ss) protecting the mid yard exit crossover usually stands at clear. This allows shunting to proceed under the control of the yard staff without any need for intervention from the signalman. When it is necessary to reverse the crossover the yard box (GfS) must release the slot on signal ss, putting it to blue. The crossover can then be reversed and the signal cleared from LaC box. It will show a yellow diagonal to the right telling the driver to depart at caution to a route set to the right. 53. The aspects are called up manually. This is the combined control for L and M signals. The switches are toggled to represent the position of the points 7 and 4 and signals dd and N. It would be possible to avoid this process by using microswitches but this would introduce a level of complexity that I am not prepared to incorporate into the AFK. The selection of the correct aspect calls for concentration and discipline on the part of the operator if the wrong display is not to come up. It is a small price to pay for (relative) simplicity. I must offer my congratulations to anyone who has read this article to its bitter end. I would suggest that you must be a signalling anorak, dangerously curiously minded, like a Siamese cat, or simply a plain lunatic! I suppose that I meet all three criteria!